The so-called Orangeburg Coil is one of the major rarities of US philately and is certainly the rarest of all US coil stamps. The design of the 3¢ stamp is the familiar Washington Head. It is a flat-plate printing on single-line watermarked paper and is perforated 12 vertically. Sutton (Stamp Collector's Encyclopedia) reports that only one roll was produced. It was sold in 1911 to the Bell Pharmaceutical Company of Orangeburg, N.Y., which used it to mail out samples of patent medicine to doctors. One of the recipients, Dr. Jason Samuel Parker of White Plains, N.Y., a keen collector, noticed the new variety and wrote to the company. 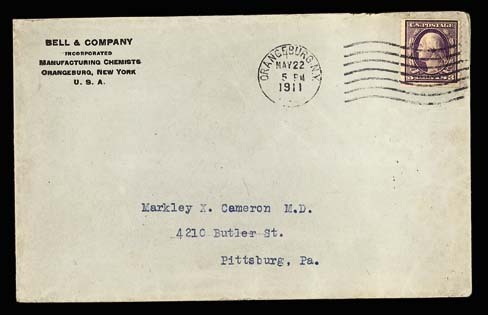 Max G. Johl (The United States Postage Stamps of the 20th Century) quotes a letter from Dr. Parker in which he reports having received a mint pair from the president of Bell Pharmaceutical in response to his inquiry. Johl notes that the stamp was produced from Plate #5120. Editor's Note: This cover with the Orangeburg coil was sold in the Zoellner Collection by Siegel.